CompareNBuy is just another adware application in a long line of similar pieces of software, made using the JustPlugIt engine. They are known to be annoying to deal with while on your computer, without any real redeeming qualities. If you have CompareNBuy, it won’t take long to wish you knew how to remove it. Read on to find out how this adware works and how to get rid of it. This adware is known to be distributed via the InstallRex installers. The most popular way to get them running on your computer is to click a fake download link on torrent and other file-sharing websites. You should always take extra care while visiting such pages, as they are sometimes known to contain more than the usual adware. You could get infected by malware if you’re not careful. If you do frequent these kinds of websites, we recommend getting a professional antimalware tool to scan your system, remove any threats and provide real-time protection. Like the whole JustPlugIt family of adware, CompareNBuy works by collecting browsing data about its user. It uses this information to determine your hobbies, the things you might want to buy, and so on. When enough information is collected and other activation conditions meet their criteria, CompareNBuy starts doing its work – delivering commercial adverts onto your web browser screen. The ads this application shows are mostly focused on shopping, offering you great deals for things you’re interested in, in the form of coupons, pop-ups, banners, etc. If you don’t want to get bombarded by ads, it’s better to preemptively remove CompareNBuy. You should also be advised that if you click an ad provided by CompareNBuy, its developers will get paid for the additional traffic to the site the advert links to. You will not get anything for the part you played in this scheme. So, don’t make money for people you don’t know without getting anything in return. If you’re ready to remove CompareNBuy, you could do it in two ways. We recommend using an automatic antispyware tool. It’s simpler and safer. If you would prefer to do it manually, we have to caution you that this method does nothing to take care of any other threats that might be present on your system. Nevertheless, the instructions are provided below. Click Add or Remove Programs, find and click comparenbuy. Click the Windows button, go to Control Panel. 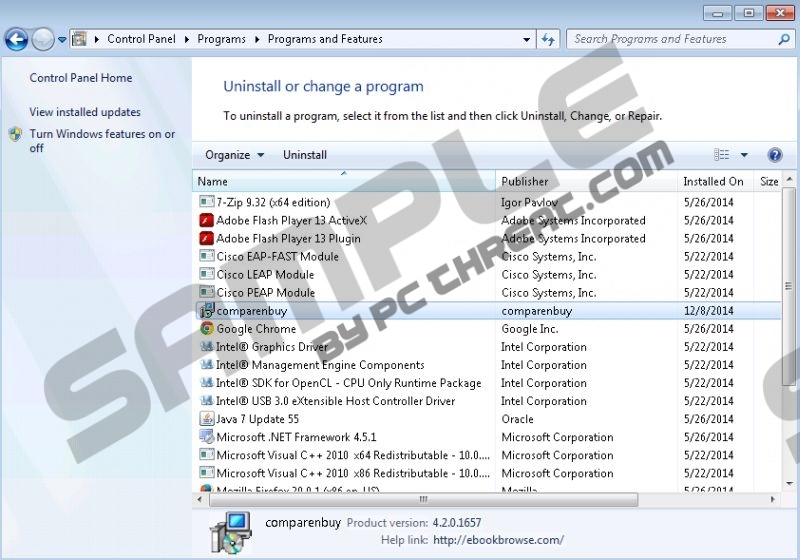 Click Uninstall a program, find and click comparenbuy. Right-click the bottom-left corner of your Desktop, go to Control Panel. Quick & tested solution for CompareNBuy removal.